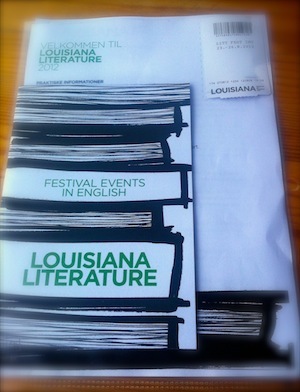 My ticket for this year’s Louisiana Literature has arrived. I am psyched and ready to dig my festival heels into the tarmac, up close and personal, first row baby, at the annual show of authors and audience galore. Hoping that my smile and winks will get the attention of those heavenly, holy, saintly, divine, godly, godlike, ethereal, otherworldly; immortal, angelic, seraphic, cherubic beings, perhaps a quote, or at least a good snap with the hipster filter. If you have any interest in names such as Patti Smith, Kerstin Ekman, Jonathan Safran Foer (you would), Cia Rinne (you should), Judith Schalansky – I could go on… so I will – Linn Ullmann, César Aira, Anne Carson and Tomas Espedal et cetera, and no interest in going to Louisiana to ogle (or you just plain and simple can’t), but still would know what it was like; stick around kid. This might get interesting. Refresh your memory of LouiLit last by checking this post out, or looking through the pictures here. Also, I am on Twitter – if you want to follow the hopefully steady live-tweets.